A combined total of eleven newspapers and television stations using various publishing systems have accepted and renewed agreements to use Field59’s video platform to publish their online video. 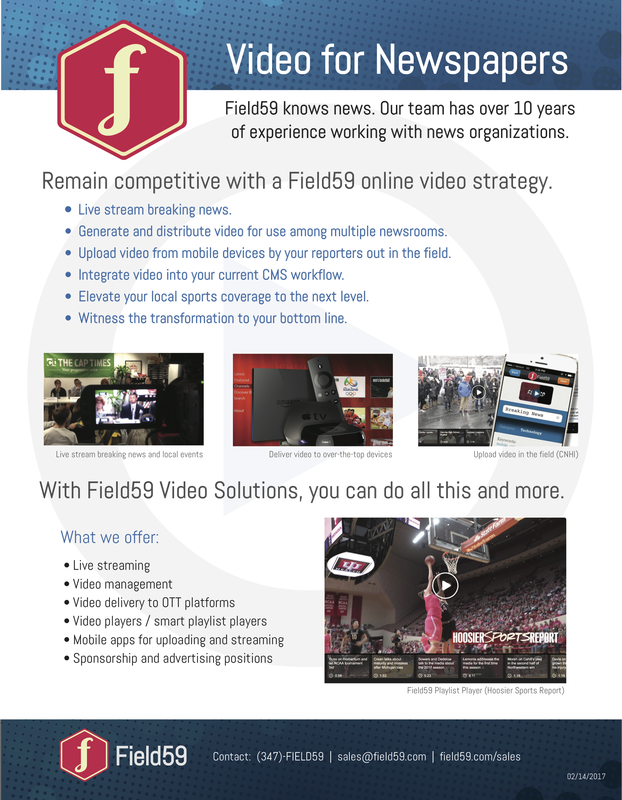 Madison, WI – Field59, a premier online video management system for live streaming, video-on-demand and video distribution solutions, today announced new partnerships and renewals with 11 newspapers and television stations that plan to use Field59’s video platform to power their digital video efforts. Field59 welcomes five Calkins Media newspapers, WEHCO’s Whole Hog Sports, El Vocero, and KTBS, while renewing relationships with White Mountain Publishing and Rockfleet Broadcasting’s stations WJFW and WVII. Calkins Media’s newspapers have pioneered OTT (Over-The-Top) online video content in the newspaper space, and found the perfect partner with Field59’s video delivery solution in late 2016. Additionally, Field59 has secured recurring live streaming business from events for corporate, startup accelerator, and educational customers, such as Exact Sciences, gener8tor, and WSGNA. Last week, Field59 live streamed and recorded a series of talks at the WSGNA (Wisconsin Society of Gastroenterology Nurses and Associates) 2017 Spring Conference in Milwaukee. The live stream was watched by viewing parties in Wisconsin and Kentucky, and the recorded videos will be offered to earn credits for continuing gastroenterological education for nurses and practitioners. Field59 is a premier online video management system for news, media companies and premium content creators. They work with any CMS, and offer cloud-based, video management, distribution, integration, and live streaming solutions for desktop, mobile and OTT devices. Field59 is headquartered in Madison, WI, and is a trusted partner of Calkins Digital, Calkins Media, Inc., Schurz Communications, Community Newspaper Holdings, Inc., Woodward Communications, Gray Television, Rockfleet Broadcasting, Morris Multimedia, Exact Sciences and George Lucas’ Educational Foundation, Edutopia.